The early challenge for Windows Phone was to leverage their innovative new design language 'Metro' to do justice to Spotify's core - a social, rounded, music experience. 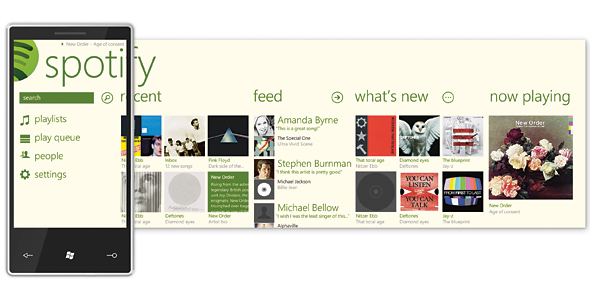 When Windows Phone launched in 2011, I worked on a collaboration with Veryday, Microsoft and Spotify to build the front-end for a Spotify experience for the Windows Phone based on the design language - 'Metro'. I most enjoyed mapping the core Spotify experience at the time on iOS and Android - thereafter deconstructing it to fit the essence of Metro - to make it personal, relevant and contextual to the user. We used panoramas to leverage artist bios, albums and social feeds. Play screen, additional actions and playlist views.